22. 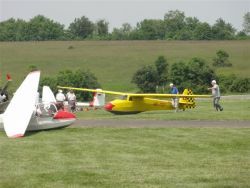 OSV Meetings (Vintage Glider Association Switzerland) on the Hornberg, Germany, from the 25 to 27 June 2010. Why the Swiss oldtimer meeting was on the Hornberg? Now for some time, Marius Fink (living in Switzerland) is a member of our OSV. But his roots for fligh gliders he has on the Hornberg, where he is still a member of Schwäbisch Gmünd club. At our annual meeting in spring 2010, has Marius spontaneously agreed to organize the OSV meeting for this year. Many OSV memberthought, the way to the Hornberg is to fare away. That was a mistake not to go and take the journey on the Hornberg. perhaps something seemed very far, which is regretted in retrospect have when we learned of the excellent conditions that we were there take wraps on the Hornberg! The excellent infrastructure of the BWLV on the Hornberg had nothing leave to be desired. At first the top briefings with Uli Gromann, flight school principals, as well as a collegial flight operations with all the many helpers around the organizer Marius Fink. All them, the tow pilots, flight controllers, the retrievals and all volunteers deserve our sincere and heartfelt thanks. So from Thursday 24 of June, then again and again the participants with their gliders arrived. Friday to Sunday we were treated to glorious weather and thermal conditions downright fantastic. With long flights the Alb along with our Oldies we enjoyed every day for hours of enjoyable flights without any competition-Stress. An incomparable event. Some of the participants used then in the subsequent week, the optimal conditions to more wonderful flights. As a loyal helper with this were, of course, as always, our very active chairman Fahrni Willy and Max Räz. On Sunday evening all participants were allowed to take from the hands of Willy a lasting keepsake in reception. Each evening we all met together in the airport restaurant to share the day saw happen Revue leave. For excellent Italian dishes from the kitchen and cellar, there was some new acquaintance. The OSV Meeting 2010 on the Hornberg all who were there will be remembered forever, and one or the other determined to go again to the beautiful Hornberg.